Kinetics Control Systems SVRI Exciter/Regulator rectifier is designed and rated in capacity for the application of exciting the DC fields of an AC generator operating independently with other generators and/or NOT tied into a utility power grid. The SVRI rectifier is a packaged system for the application of excitation of an AC generator field from a "black start" condition utilizing residual magnetism, regulating DC to the generator field for stable generator operation and capacity for 150% rated field forcing. The SVRI DC voltage regulation and field forcing capacity permit the SVRI excitation system to compensate for "voltage droop" resulting from step or impulse loading variations. Kinetics’ solid state logic circuitry provides a timed interval unit phaseback circuit preventing the generator field and exciter from operating in the "forced" mode for an excessive period of time. The SVRI, independent operation exciter/regulator rectifier is a self contained, solid state, semi-conductor packaged excitation system containing, an isolation dry type transformer, semi-conductor rectifier bridge (3 phase with cumulating diode), solid state SCR firing circuitry, field forcing capacity, "black start" generator buildup circuit and a NEMA1 steel enclosure. The SVRI is designed to meet the highly inductive load operation conditions of AC generator field excitation applications. 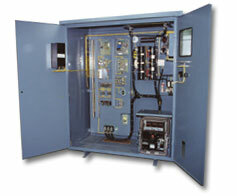 Excitation systems are available as modular or chassis for panel board installation and system OEM applications. Customized optional features are available and detailed under the heading of "options". Additional options besides those listed are available; factory applications engineers are available to assist in providing optional features to meeting a given application’s requirements.